​July 7 - 11 in Phoenix, Arizona. There are currently scholarship opportunities available from CSTA to attend the conference. Be sure to join the CSTA Iowa Chapter to connect with other Computer Science teachers in Iowa. The Governor's STEM Advisory Council is offering six high poverty elementary schools the opportunity to be awarded $50,000 toward transforming their school into a model for computer science instruction. Applications are due March 29, 2019. The Governor's STEM Advisory Council has announced their 2019-2020 Scale-up Programs. Many programs offer Computer Science related content. Applications are due March 4, 2019 by 5:00 pm. 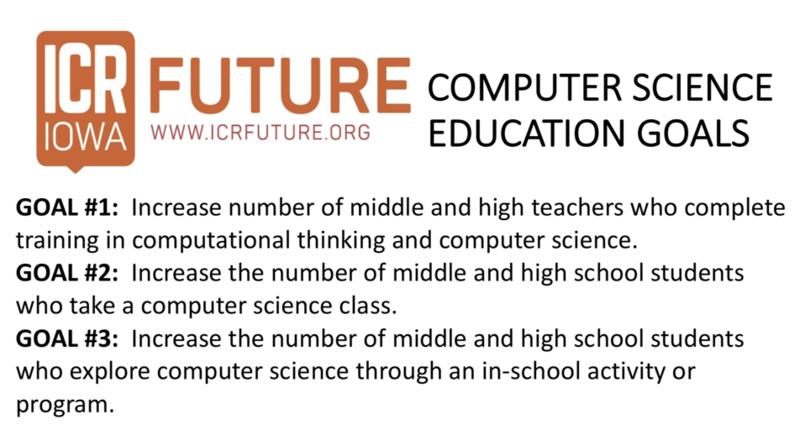 ICR Future is a coalition of educators, employers, and organizations working together to develop our future workforce in Iowa City-Cedar Rapids (ICR). Click the button below to see current professional development opportunities available to educators. It's not too late to do an Hour of Code! We'll celebrate all year! ​What will you create? Creativity is the theme for the 2018 Hour of Code! Learn more and explore our resources.